Drainage Area: 25 sq. mi. Anita Dam is located about 22 miles north of Chinook, Montana, about 5 miles south of the Canadian border. The drainage, which normally flows only in response to snowmelt or heavy rain, is an unnamed tributary of the East Fork of Battle Creek, which flows southward into the Milk River. Construction of Anita Dam was completed in November 1996. The embankment dam has a height of 36 feet, a crest length of about 1,012 feet, and a crest width of 14 feet. The reservoir impounds 794 acre-feet. 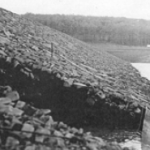 The embankment was constructed with an overflow 36-inch diameter steel outlet conduit as the principal spillway. Two additional natural spillways were located on the reservoir rim to safely pass the probable maximum flood. The embankment was constructed as a homogeneous fill with a layer of upstream riprap. After the incident, it was determined that the fill material was a lean clay (CL) with dispersive properties. 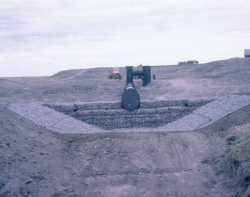 The spillway conduit for Anita Dam utilized a series of concrete anti-seep collars surrounding the conduit, but without a continuous cradle. During construction “flowable” backfill (essentially a high slump soil cement) was placed under the conduit to provide support between the anti-seep collars. Rock-filled gabions were used at the downstream end of the conduit. During the spring runoff of 1997, unusually heavy snowpack caused the reservoir to fill in the 4 days immediately prior to the failure. On the morning of March 26, a large leak beside the outlet conduit was noticed. Emergency response teams were dispatched to the site. 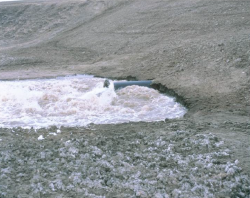 Upon arrival, the teams verified the large amount of leakage around the conduit, along with multiple vortexes in the reservoir water surface about 150 feet upstream of the embankment dam. 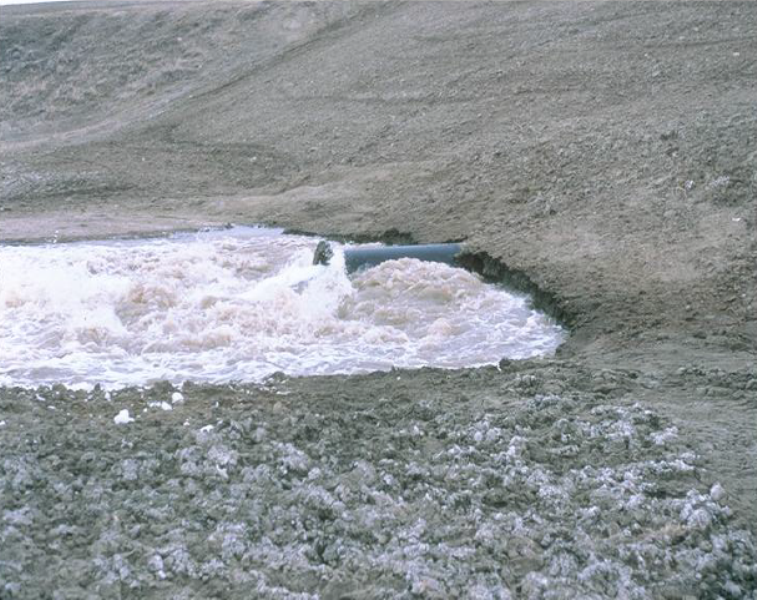 Outflow from the outlet conduit and leakage was estimated to be about 400 cfs; this greatly exceeded the capacity of the outlet conduit alone. Around-the-clock surveillance was instituted. Nineteen families downstream of the embankment dam were notified of the potential for evacuation and four families chose to evacuate. During the next day, a local National Guard Unit and Type II Incident Command Team were dispatched to the site. A helicopter was utilized to assess surrounding conditions, including flow into the reservoir. 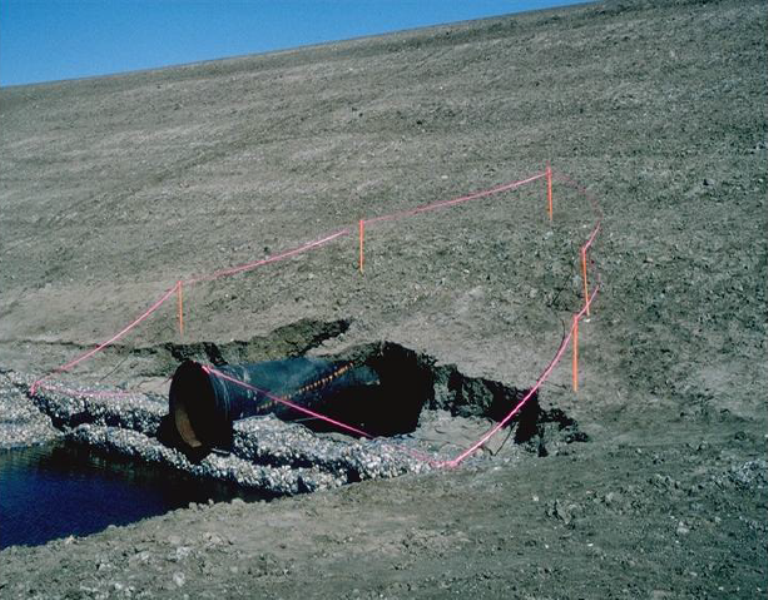 The reservoir completely drained through the outlet conduit and caverns in the earthfill adjacent to the conduit, concluding on March 27, 36 hours after initiation of the incident. Complete embankment dam collapse did not occur. 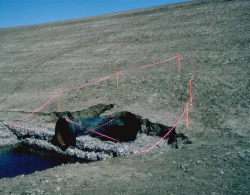 Following drainage of the reservoir, inspections indicated that the embankment material had been completely eroded from around the outside of the conduit. The open tunnels immediately adjacent to the outlet conduit extended from the upstream embankment toe completely through the embankment dam to the downstream toe. The cause of the failure was likely the combination of the dispersive clay embankment material, hydraulic fracture, anti-seep collars around the conduit that required the use of hand tampers, “flowable” backfill for conduit support in lieu of a continuous concrete conduit support, and lack of a filter and drain around the outlet conduit in the downstream portion of the embankment dam. Cold air flowed through the conduit during the winter preceding the failure. This caused lenses of frozen material in the conduit’s backfill. 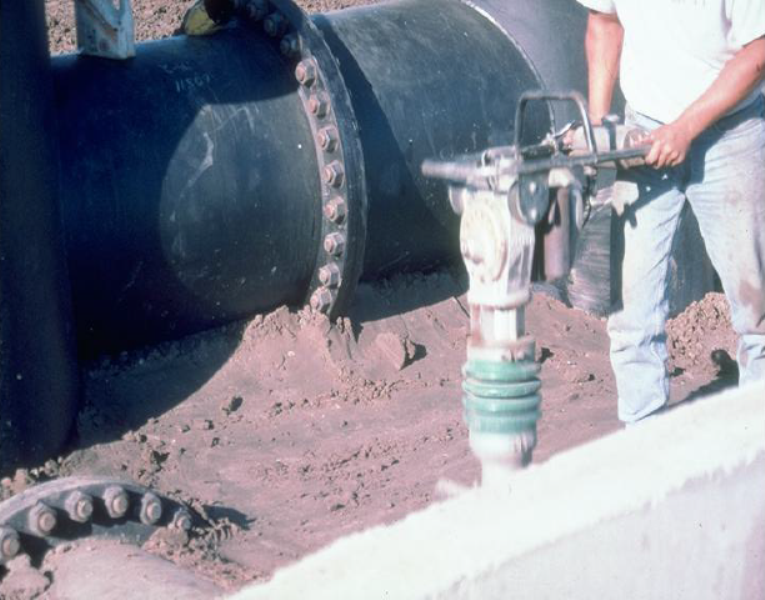 These lenses may have provided a path for concentrated leakage when they were thawed by the initial flow of water in the conduit during the runoff. (1) FEMA. (2005). 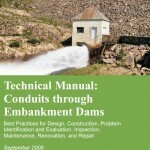 Technical Manual: Conduits through Embankment Dams, Best Practices for Design, Construction, Problem Identification and Evaluation, Inspection, Maintenance, Renovation, and Repair. Federal Emergency Management Agency. 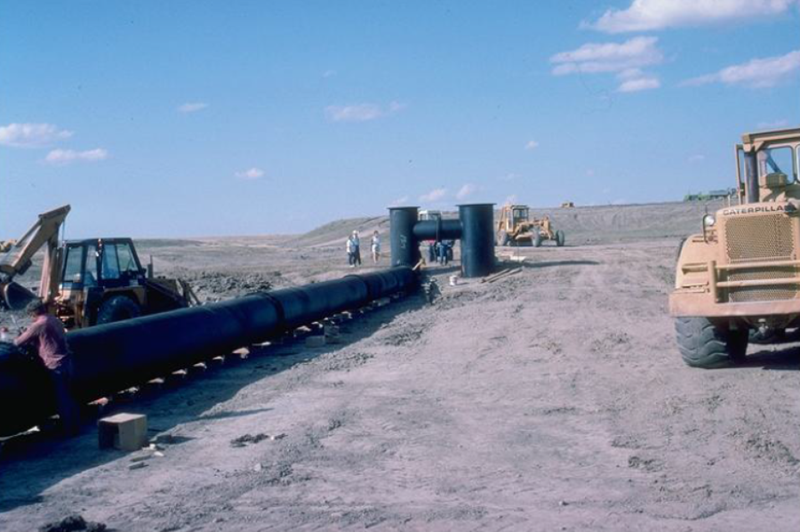 Conduit placement and installation during construction of Anita Dam. Compaction of soils around conduit at Anita Dam. 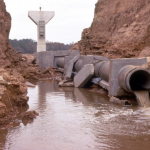 View of spillway conduit from downstream during construction of Anita Dam. View of spillway conduit during the incident in 1997. Note the erosion of the soils at the embankment and around the conduit. View from downstream of the embankment erosion around the spillway conduit following the incident. Part 1 of an instructional video by Dr. Ralph Peck on seepage and piping as part of the Federal Emergency Management Agency’s Expert Video Series on dam safety. Part 2 of an instructional video by Dr. Ralph Peck on seepage and piping as part of the Federal Emergency Management Agency’s Expert Video Series on dam safety. Animation of a piping failure developed by the Association of State Dam Safety Officials. A concrete encasement or cradle around conduit penetrations through earthen embankments allows for their compaction of earthfill. Technical Manual: Conduits through Embankment Dams - Best Practices for Design, Construction, Problem Identification and Evaluation, Inspection, Maintenance, Renovation, and Repair. Bureau of Land Management. (2007). Anita Reservoir (Blaine County, Montana) Dam Failure: Report by Board of Inquiry.